Opera (aKa Terror at the Opera) is a 1987 giallo from horror maestro Dario Argento (Deep Red, Suspiria, Inferno, Tenebre, & Phenomena). Argento based the movie on his own experience from directing a disastrous production of Giuseppe Verdi’s Macbeth. So it’s pretty obvious the character of Marco is based off himself. Argento made a tough decision early on when he decided to cast an actual opera singer over a trained actress for the lead role of Betty. Which lead to numerous arguments with Cristina Marsillach, Dario said she was the most difficult actress he has ever worked with in his entire career. This set/film seemed to be cursed considering Vanessa Redgrave dropped out of the film the last minute, Ian Charleson (This was his last film appearance) found out that he was HIV positive during it, Actor was accidentally killed on the set (crushed by a car), Argento’s relationship ended with Daria Nicolodi, & his father died during the production of this. Orion Pictures picked up U.S. distribution for this in 1989 but due to financial issues & Argento refusing to cut the film’s final sequence after they demanded it to be removed. It went from a planned big theatrical run to basically a direct to video release. Despite all the problems during production it was commercially successful in Italy & other places overseas, One of Dario’s BEST selling movies in his home country. 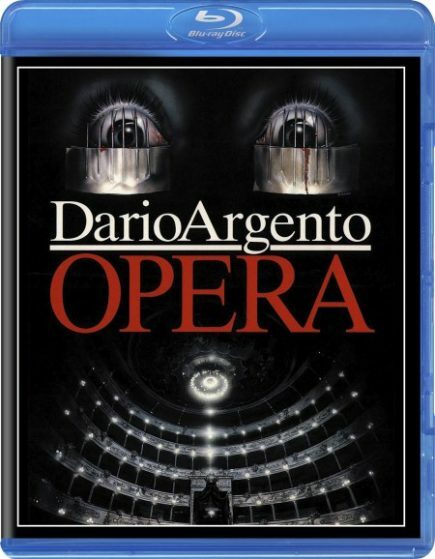 Opera is considered Dario Argento’s last GREAT film by most (Personally, I still really enjoyed Two Evil Eyes, Trauma, & The Stendhal Syndrome). The egotistical & short tempered star Mara Cecova is injured after getting hit by a car outside the theater. Before she is informed about her new found luck Betty (played by: Cristina Marsillach from “Every Time We Say Goodbye” & “Marrakech Express”) receives an mysterious call informing her about the change before her agent Mira (played by: Daria Nicolodi from “Deep Red”, “Beyond the Door II”, “Inferno”, “Tenebre”, “Phenomena”, & “Delirium”) can give her the good news. This means the young understudy FINALLY gets her shot at the famous role of Lady Macbeth. She knows every line & she hits every note, she has been prepared for this moment. She is an instant success with her performance, a stranger sneaks into the opera house to watch the new star shine but quickly gets caught by a stagehand in the empty box. Fighting to go unnoticed the masked fan impales the stagehand on a coat-hook & leaves him for dead. This causes electrical problems which gets everyone’s attention at the Opera. She is greeted by her first “fan” after the show, it turns out to be Police Inspector Alan Santini (played by: Urbano Barberini from “Demons”, “The Black Cat”, & “Casino Royale”). She seems disappointed because she thought he was just a normal person appreciating her work but she just figures he is doing his job & trying to investigates what just happened. Santini asks her “Why I can’t I be both?” Later on Betty is at her boyfriend’s apartment. Stefano (played by: William McNamara from “Copycat”, “Dream a Little Dream”, “Surviving the Game”, & “Chasers”) is also the stage manager of the Opera production. The unknown monster from earlier has tracked down the new star of the show & overpowers Betty while he’s away. This stranger wants his own audience for his murderous work so he gags her with some tape, ties her up, & putting needles beneath her eyes so she can witness everything he does to her boyfriend. She is forced to see every gruesome detail with no way of helping or stopping this living nightmare. After he is finished, he unties Betty & leaves the scene of the crime. She remembers her troubled past & childhood terror, a similar hooded killer who murdered her mother years ago. She decides to not get the police involved & confides in her director Marco (played by: Ian Charleson from “Chariots of Fire”, “Gandhi”, & “Jubilee”) instead. The Next day, Santini is at the Opera house investigating Stefano’s murder. Betty arrives late to rehearsal & avoids him. The curse of Giuseppe Verdi’s Macbeth continues. Giulia (played by: Coralina Cataldi-Tassoni from “Demons 2”, “The Phantom of the Opera”, & “Mother of Tears”) from wardrobe complains to Betty about having to repair her dress already & shows her a gold bracelet sewn onto it that wasn’t there before. Giulia goes away to find something to help them read what’s on the new found bracelet. As soon as she leaves, the masked killer appears again & does the exact same thing he did to her the other night. 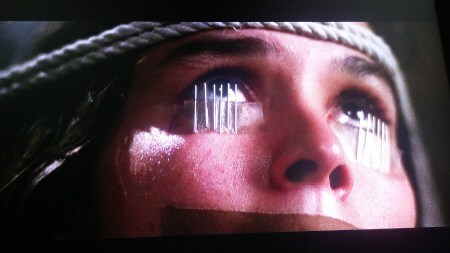 He gags her with some tape, ties her up, & putting needles beneath her eyes so she can witness his next act of destruction. He attacks Giulia to get the bracelet back. 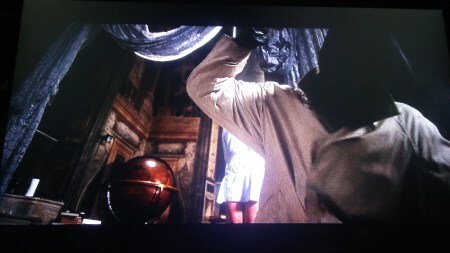 At one point when they are fighting Giulia removes the killer’s mask & recognizes them right away. A moment of distraction leads to him repeatedly stabbing her until she bleeds to death but she accidentally swallows the bracelet with her last breath. He is forced to retrieve it from the corpse to remove any evidence connecting to the previous kills. Once again, he unties Betty & escapes the murder scene. She is confronted by Santini about marks on her body & what she has to do with these events. She is back at her place putting eye drops in as a police officer comes inside. Her vision is blurry so she doesn’t see the man. Her agent Mira stops by & tells her that she just talked to a police officer outside in the lobby. Paranoia strikes fast as the two try to figure out who is real & who is the imposter. Soon after, the officer outside knocks on the door & Mira looks through the peep hole, In one of the most innovative shot scenes Mira is instantly murdered as the killer breaks in. Betty is forced to hide, she discovers the real cop inside stabbed to death. After a deadly game of cat & mouse with her vision still blurry she escapes through a ventilation shaft when her young neighbor helps her into a safe place down the hallway. The next day, Betty returns to the Opera House & director Marco has a plan to find out who’s the person behind all this mayhem. 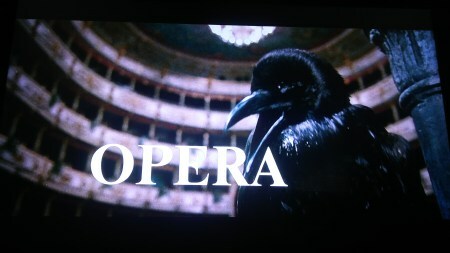 During the next performance, he unleashes a flock of vengeful ravens into the audience. The birds recognize the face of their attacker from the other night & starts gouging out one of his eyes! THE KILLER IS REVEALED!!!! He captures Betty again & reveals the motivation for why he’s been after her. Tells her about his past & disturbing connection with her mother. She is blindfolded & tied to a chair when the villain sets the place on fire staging his own death. Everyone thought it was all over until Marco hears a radio broadcast that confirms the murderer was still on the loose. This leads to a bloody final confrontation!!!! Cinematographer Ronnie Taylor makes this a GREAT viewing experience, you are moving with the camera in various ways & angles throughout the film. You get to witness some of the most unique shots in cinema history with this NEW 2K transfer from Scorpion Releasing with over 45 hours of extensive color correction! This is the BEST Opera has ever looked, the last time I watched this film was in 2001 with the Anchor Bay DVD so this Blu Ray looked like a completely NEW film after it was over. The Heavy Metal score from various musicians which includes Goblin’s Claudio Simonetti pounds through the sound system with this DTS-HD MA 5.1 mix. The audio track used for this retail version is the familiar English dub. It’s the main version I’ve watched with this movie my whole life.The extras/special features include: a interview with director Dario Argento (21 minutes), a brand new interview with star William McNamara, two theatrical trailers, & a “Coming for Christmas” teaser. It’s good to see two labels like Scorpion Releasing & Doppelganger Releasing come together to bring us some quality Italian horror in high definition!!! !